What’s so Special About the H2O MOP X5? Is it a mop, or is it a steam cleaner? Actually, the H2 MOP X5 is a little bit of both. The versatile machine can clean floors, clothes, appliances and more thanks to its unique design and a wide variety of add-ons. How do you improve such a simple, yet effective cleaning tool like the mop? You develop the H2O MOP X5. This device makes cleaning a breeze thanks to a variety of features that are simple, yet useful. Right away, you realize that this mop is just different. It covers a ton of surface area in very little time, and it has the right type of angles to help people easily reach into every crevice around the home. Mops are usually reserved for just the floor when it comes to cleaning. If you only use the X5 Mop for the floor, you are not really getting the most out of the cleaner. The accessories that come with the mop are there for a reason. The H2O MOP X5 provides users with a ton of versatility that other mops just could not provide. 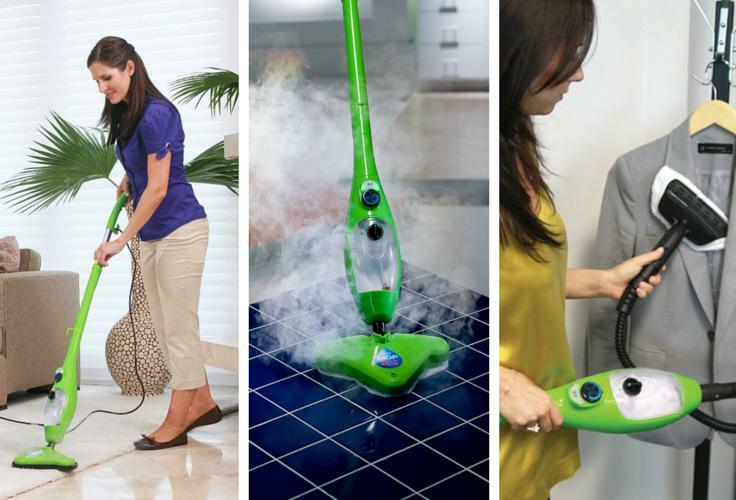 The mop can easily convert into a hand-held steamer, a window cleaner and even a garment steamer. While some might originally balk at the price of the mop, once you realize the versatility you begin to understand how often you’ll use the product. Perhaps the best part about this mop is that no harmful chemicals are needed in order for it to work. The steam that is released from the MOP X5 not only helps clean the floor, but it also leaves little to no trail as you go around the floor cleaning. Users also don’t have to worry about children or pets accidentally getting mixed up with potentially hazardous cleaning chemicals. Overall, reviewers are pretty satisfied with the MOP X5. The mop can do a lot of thinks pretty well, but doesn’t do anything great. That is both the reason for its positive reviews and negative reviews on Amazon. Those pleased with the mop are happy to have one tool to handle all of its cleaning tasks around the home.